Many animals were used during World War One. 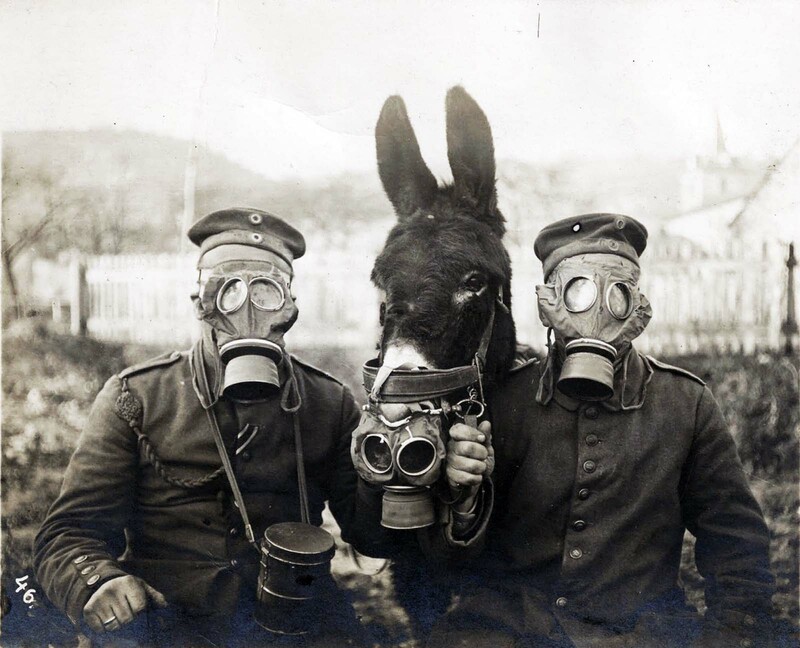 Horses, mules, dogs and pigeons were vulnerable to poison gases so that special protection was necessary for them. Horses were equipped with gas masks over their muzzles and were protected from inhalation of poison gases such as phosgene. Equine eyes were not affected by lachrymatory agents so that their masks consisted only of specially made nose bags but, unfortunately, these animal’s eyes were vulnerable to the effects of chlorine and vesicatory gases. Of the million British horses sent overseas to help with the war effort, only 62,000 returned home. This is the forgotten tragedy of the Great War – a conflict that pitched as many animals into the line of fire as it did humans. For years few knew of the unimaginable suffering of the beasts transported across the Channel to the Western Front. In 1914, both sides had large cavalry forces. Horse and camel-mounted troops were used in the desert campaigns throughout the war, but on the Western Front, new weapons like the machine gun made cavalry charges increasingly difficult. However, animals remained a crucial part of the war effort. Horses, donkeys, mules and camels carried food, water, ammunition and medical supplies to men at the front, and dogs and pigeons carried messages. Canaries were used to detect poisonous gas, and cats and dogs were trained to hunt rats in the trenches. The Hague Declaration of 1899 and the Hague Convention of 1907 forbade the use of “poison or poisonous weapons” in warfare, yet more than 124,000 tons of gas were produced by the end of World War I. The French were the first to use chemical weapons during the Great War, using the tear gases, ethyl bromoacetate and chloroacetone. One of Germany’s earliest uses of chemical weapons occurred on October 27th, 1914 when shells containing the irritant dianisidine chlorosulfonate were fired at British troops near Neuve-Chapelle, France. Germany used another irritant, xylyl bromide, in artillery shells that were fired in January 1915 at the Russians near the town of Bolimów, nowadays in Poland. The first full-scale deployment of deadly chemical warfare agents during World War I, was at the Second Battle of Ypres, on April 22, 1915, when the Germans attacked French, Canadian and Algerian troops with chlorine gas. Deaths were light, though casualties relatively heavy. A total 50,965 tons of pulmonary, lachrymatory, and vesicant agents were deployed by both sides of the conflict, including chlorine, phosgene and mustard gas. Official figures declare about 1,176,500 non-fatal casualties and 85,000 fatalities directly caused by chemical warfare agents during the course of the war.